Rhododendrons are wonderful plants, capable of fulfilling many landscape needs. They bloom in nearly every color you can imagine and their boom time varies so much, from early spring to mid-winter, you can have a Rhododendron in flower nearly year-round. Contrary to popular belief, Rhododendrons do fine in full sun. In their native China, Rhododendrons serve as the forest canopy, meaning they fill the role of trees by serving as the tallest plant in the forest. 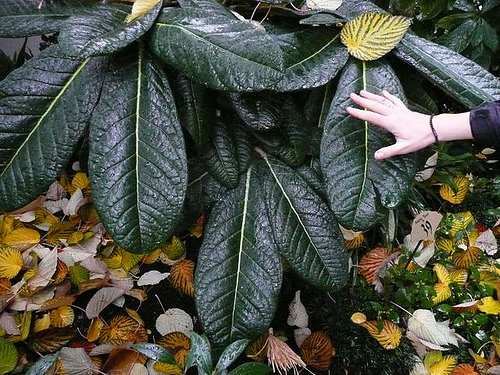 A huge, old Rhododendron is truly a sight to see! Due to their popularity, many forms of Rhododendrons have been developed by plant breeders over the years. Evergreen Rhododendrons can range in size from 12-18” tall and wide (R. impeditum) to giants with 3’ long leaves (such as R. sinogrande). Most Rhododendrons range in between, with many interesting forms available such as R. ‘Baden Baden’, a sweet little selection with cherry red flowers and twisted leaves, to any of the Yakushimanum (the Yak Rhododendrons), which are medium sized Rhododendrons with a range of pink to white flowers and silver fuzz on the undersides of their leaves, to little known selections such as R bureavii, which is grown not so much for its flowers, as for the generous covering of rust colored hairs on its leaves, which is soft as a bunny nose. Evergreen Rhododendrons do well to have faded blooms removed. This is accomplished by simply snapping the entire flower structure off at its base – it should come off cleanly. On the other end of the spectrum are deciduous Rhododendrons (those which lose their leaves). These often have highly fragrant blooms in shockingly bright colors and their foliage is a riot of red, crimson and orange in the fall. These Rhododendrons adapt well to landscapes ranging from full sun to mostly shade. Lastly are the Azaleas, all of which are actually Rhododendrons. 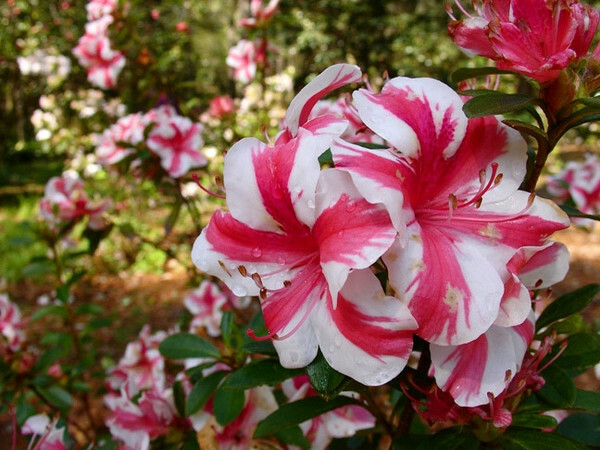 Azaleas tend to bloom from early spring to early summer. They tolerate clipping and shearing much better than their larger leaved counterparts because of their small foliage. 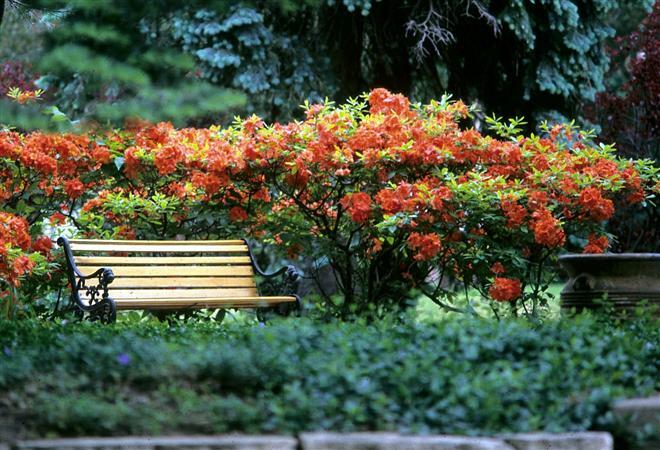 Azaleas are often used in formal gardens. Rhododendrons belong to a group of plants which respond well to ‘rejuvenation’ pruning – this means they will tolerate severe reduction in size in order to correct their growth habit. The most important thing to remember is to perform your pruning after the flowers fade, which will allow the plant to form new buds for next year. Pruning at any other time runs the risk of removing next year’s buds. Ideally, remove no more than 1/3 of the plant per year until you reach your desired size and/or shape. If you need to remove ½ of the plant’s growth or more, be prepared to wait at least one year before the plant will bloom again. Be sure to make clean cuts – do not leave any broken or shattered branches behind. You will see new growth form at or very near your cuts. Because you may get a strong flush of new branches, keep an eye on your newly pruned Rhododendron and be prepare to thin out any areas where the new growth is too numerous. Rhododendrons prefer acidic soil. 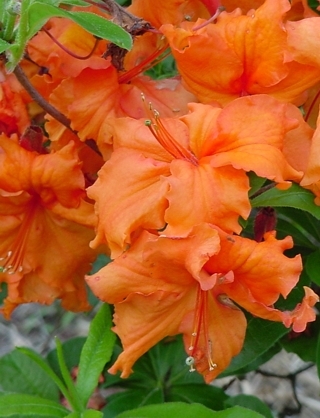 There are fertilizers available formulated specifically for acid loving plants such as Rhododendrons. Follow manufacturer’s instructions; depending on the type of fertilizer you use, you will apply it 3-4 times per year. Don’t make the mistake of thinking Rhododendrons are just for little old ladies and outdated landscapes. Rhododendrons are available to fit every landscape. The Pacific Northwest contains a bounty of specialty growers. You should be able to find even the most elusive and eye-catching Rhododendrons in nearby nurseries or by special order. Get creative – let Rhododendrons make a comeback in your yard. 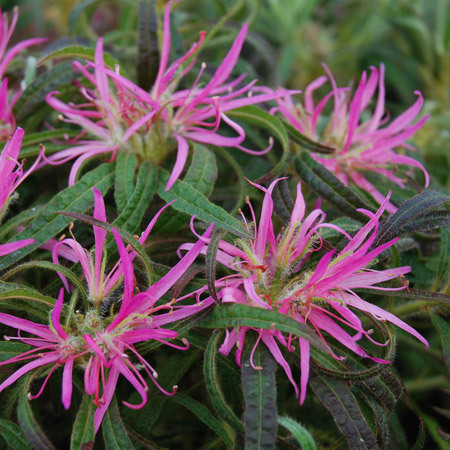 Choose unusual varieties to make the neighbors ask ‘what is that gorgeous plant in your yard?’.